The record-breaking drought in California — brought about by a severe lack of precipitation, especially mountain snows — has exacted a $2.7 billion toll on the state’s economy because of agricultural losses, researchers said Tuesday. During a briefing for the California Department of Food & Agriculture, scientists from the University of California, Davis, told officials that based on their preliminary research and modeling, the drought is resulting in a harder economic pinch this year than it was in 2014. 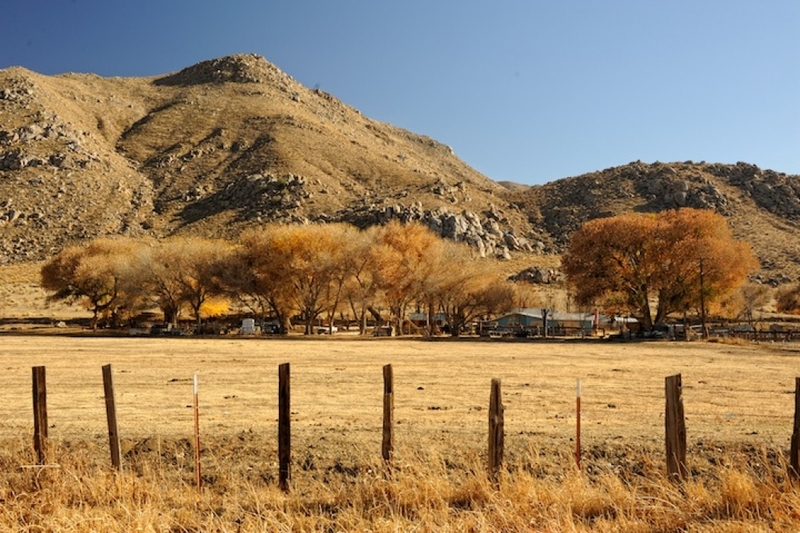 The California drought is devastating agriculture across the state. The drought, they found, will lead this year to 32 percent more acres of land laid fallow, an increase in groundwater pumping to make up for the lack of water in rivers and reservoirs, and total job losses of 18,600. The losses from this drought aren’t spread out evenly across the state, the researchers added, with areas like the Tulare Lake Basin in the southern San Joaquin Valley bearing much of the brunt. Californians are hoping that an El Nino event that seems to be gaining strength will finally change weather patterns and bring a wet winter that could spell an end to the drought, though a full recovery will likely take many years. Scientists also are studying whether climate change could mean more such deep droughts in the future and whether it made the current one worse. The drought in California has been building for more than four years, as winter precipitation deficits slowed streams to a trickle and sent reservoir levels dipping, while unusually warm temperatures increased water demand. Now, more than two-thirds of the state is in the worst two categories of drought established by the U.S. Drought Monitor. The drought particularly metastasized over the past two years, which saw dismal winter precipitation. At the end of this winter, the state recorded its all-time lowest snowpack, which measured only 6 percent of normal on April 1. That number recently dropped to 0 percent of normal, meaning there is virtually no snow left to help replenish reservoirs during the summer months. The terrible snowpack and low reservoir levels prompted Gov. Jerry Brown in April to call for the first statewide mandatory water restrictions for cities and towns. Farmers in the Sacramento-San Joaquin River Delta recently volunteered to cut their water entitlement by 25 percent this year, with the understanding that the state government won’t ask for further reductions beyond that amount. Farmers will have about 33 percent less surface water available to them this year than they would in a normal year, and is more than the shortage faced last year, the UC Davis team said. About 70 percent of that will be made up for with groundwater pumping, which will mean extra costs to farmers, to the tune of about $600 million statewide. So much groundwater pumping raises issues, though, as it pushed the water table lower and lower, causing shallower wells to dry up and deeper and deeper wells to be drilled. There is also the problem of not knowing just how much groundwater the state has and exactly how much is being pumped, which the state just last year instituted measures to better monitor. Another way farmers are dealing with the water shortage is by leaving land unused. The amount of cropland not planted this year is expected to increase 33 percent over last year, the UC Davis researchers said, to cover about 564,000 acres. The dairy industry will be particularly hit this year as the higher milk prices that buffered losses last year have dropped. 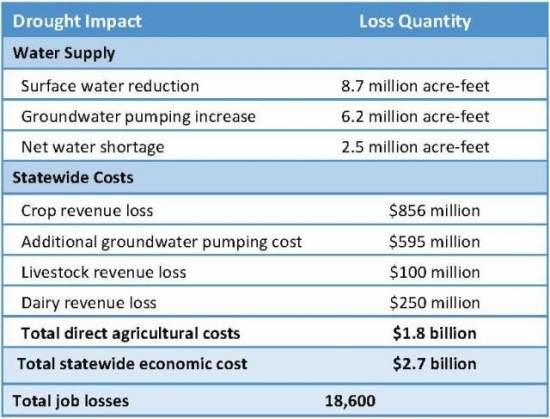 Estimates of economic losses related to agriculture in California for 2015. Click image to enlarge. Credit: Howitt RE, Medellín-Azuara J, MacEwan D, Lund JR and Sumner DA. 2015. “Preliminary Analysis: 2015 Drought Economic Impact Study,” UC Davis Center for Watershed Sciences. The combined costs from crop, livestock and dairy revenue losses and groundwater pumping amount to $1.8 billion. When indirect costs to the economy are included the costs statewide amount to $2.7 billion. Updated numbers will be released in July. While the overall job losses from the drought come primarily in contract farm labor, the overall employment picture for the state is better, with an overall employment increase of 2 percent last year, according to the Employment Development Department. The drought has prompted louder and louder calls for California to rethink how it handles and allocates its water supply, particularly in a climate that is warming and changing and could bring more such droughts in the future. The relationship between climate change and any drought is a complex one, as many factors feed into creating and perpetuating drought conditions. The clearest impact of warming on drought is when higher temperatures cause more evaporation and increase water demand, as has happened with this drought. California, in fact, recorded its warmest year on record in 2014, followed by its warmest winter ever this year. One way the state could get a better handle on its water situation would be to better use the technology available to it to understand things like how much groundwater it has and more detailed information on crops, said Richard Howitt, a professor emeritus, with UC Davis Agricultural & Resource Economics. While the state has one of the epicenters of technological innovation in Silicon Valley, when it comes to “one of our absolutely critical resources, water, we’re running in the blind,” he said.